Profile: The Bf 109 E-3 belonging to Hptm. Gunther Lutzow, Kommandeur of I./JG3 at Montecouvez in May 1940. Note the early-style canopy, the six black victory bars on the rudder and the green 'Tatzelwurm' on the nose with black, red and white details. The spinner is believed to be Black-Green 70. There is no fuselage mottle and the aircraft carries a standard fuselage Balkenkreuz and Hakenkreuz. Photo 01: Messerschmitt Bf 109E.3 Hptm. Gunther Lutzow Gruppenkommandeur 1./JG3 The Bf109E-3 of the Gruppenkommandeur of I./JG3, Hptm. Gunther Liitzow as seen at Montecouvez in late May. Finished in a high demarcation 02/71 scheme it carried the Gruppenkommandeur symbol ahead of the fuselage Balkenkreuz and the JG3 'Tatzelwurm' on the cowling in the Stab color of green. The six Abschuss bars on the rudder are believed to have been black and the spinner black-green. Photo 01: Why the Jagdwaffe did not employ drop tanks during the latter stages of the Battle of Britain remains something of a mystery and they do not appear to have been in widespread use much before the Balkans campaign of April 1941.This photograph of a Bf 109E-7 of I./JG3 and its drop tank is believed to have been taken earlier in 1941 and is therefore unusual. Unusual, too, is the segmented camouflage on the fuselage, which appears to consist of dark green lines and sprayed spots, although variations of this scheme would also begin to appear by the time of the Balkans campaign. Nine victory bars are painted on the rudder but the identity of the pilot is not known. The illustrated Emil became the subject of a fascinating event that delivered the first German ace, Oblt. Franz von Werra, into British hands. On the morning of September 5, 1940, Franz von Werra was shot down over Kent. He managed a successful belly landing, was taken prisoner, and his plane was scrutinized by RAF experts. Von Werra attempted to escape on several occasions, and finally succeeded in Canada during transfer to a POW camp. He managed to go through the United States, to South America, and then back to Germany, where he rejoined the Luftwaffe. He served on both the eastern and western fronts, but had strict orders to avoid the shores of England. The Channel, nevertheless, proved fateful for him when, on October 25, 1941 as CO of I./JG 53, he disappeared over it. W.Nr. 1480 carried the standard camouflage of 02/71/65 with white identification markings. These included the rudder and wingtips. The RAF report suggests that the engine cowl was in RLM 65, was cleaner than the rest of the airframe, and may have been a replacement off another machine. The tail surfaces carried victory marks (eight in the air and five on the ground). Positioning of them was different on each side of the fin. The RLM65 color extended to the upper surfaces of the leading edge wing. Profile 00: Messerschmitt Bf 109E-4 of Gruppenstab II./JG3 flown by the Gruppenadjutant, Oblt. Franz von Werra. The Bf 109E-4, Werk Nummer 1480, flown by Oblt. Franz von Werra of JG3 which forced landed at Winchet Hill, Marden, Kent on the morning of 5th Sep 1940 . Finished in a high demarcation 02/71 splinter pattern there was no discernible mottling applied to either the fin or fuselage sides. The lighter finish of the removable cowling panel immediately ahead of the windscreen indicates this was a replacement taken from another aircraft. The tips of the main wings and the whole of the rudder were painted white, the black-green spinner had two white segments, and the black and white shield of II./JG3 was carried beneath the windscreen on both sides of the aircraft. Photo's 01-02: Another Bf 109E shot down on 5 September was this E-4 flown by the Gruppenadjutant of II./JG3, Oblt. Franz von Werra, one of the Luftwaffe's well-known personalities of the Second World War and fated to become known as 'The One That Got Away'. Von Werra's Bf 109E, already damaged during a morning freie Jagd over Kent, was again attacked by P/O B.G. Stapleton of 603Sqn forcing him to land his crippled fighter at Love's Farm, Marden, Kent. Taken into captivity and eventually transported to Canada for internment in a PoW camp, von Werra was able to escape to the USA and eventually returned to active duty before being killed on 25 October 1941. Photo's 03-05: Obit. 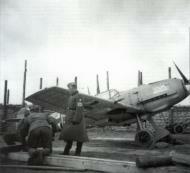 Franz von Werra's Bf 109E-4 W.Nr.1480 after its forced landing at Love's Farm, Marden, Kent, on 5 September. Von Werra's Abschuss bars were positioned differently on each side of the fin. The downward-pointing arrows indicate aircraft claimed destroyed on the ground while the standard victory bars represent air-to-air kills. This aircraft was later taken to Farnborough for examination.